Anthony McHenry continues to be the pillar of the team. 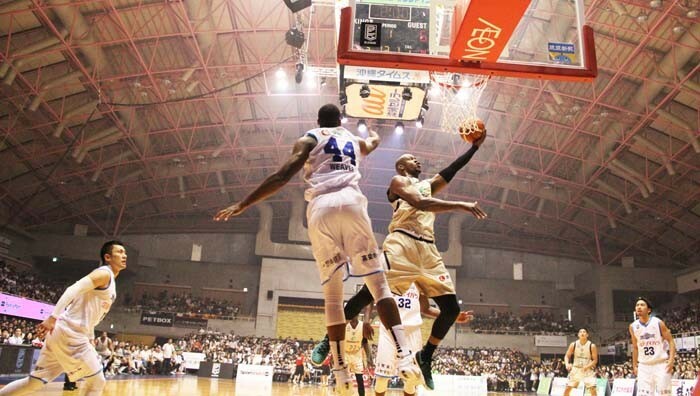 Although the Ryukyu Golden Kings had a disappointing start with the inaugural series of games in the B. League against Alvark Tokyo, the weekend pair of matches against Shiga Lakestars gave the team a chance to redeem themselves. Kazuya Hatano (#10) is one of the new faces in the team. And they did. By winning both of the games, a squeaky 59-56 on Saturday, and then steamrolling their opponent 77-49 on Sunday, the team reassured their fans that they have what it takes. In the team’s first B. League victory on Saturday, the Kings go into a strong start leading 25-9 after the first quarter. However, the Lakestars woke up in the second and outscored the Kings 21 to 6 to nearly even out the score at half time to 31-30. At the end of the third quarter the score was even 44-44, but the Kings were able to squeeze out a victory with 59-56. During the game, both teams had trouble making 3-point shots with the Kings being able to make only 4-for-22 and Lakestars scoring even worse at 4-for-24. Naoki Tashiro (#24) is also new to the team. After the game, Tsutomu Isa, the Head coach of Kings said the support by the fans made all the difference. “Their support really propelled us to do our best, and we really appreciate it. I’m really relieved now with our first win this season. In the opening game in Tokyo, we could not play in our style, and we tried to restart that from this home game,” Isa said. Sunday’s game was a different story. 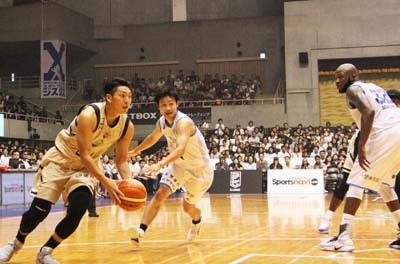 The Kings got into an equally strong start leading Shiga 21-6 after the first quarter. In the second quarter Lakestars were able to hold to the pace of the Kings, and the number at halftime were 39-25. 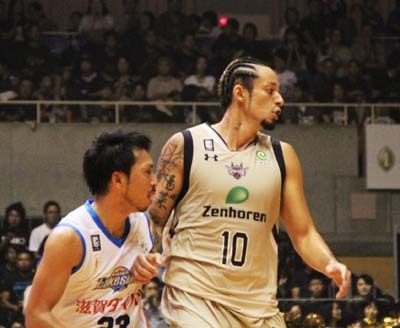 The third quarter was equally even with the Kings’ scoring one over the Lakestars, 14-13 for the quarter, but in the fourth quarter the Kings just kept going and outscored Shiga 24-11 winning the game decisively 77-49.